The team at PIE	is ready to help you get the answers you need. The team at PIE	will reply to your questions about Get extension name	shortly. We appreciate your feedback about your support experience with The team at PIE, developers of WooCommerce Waitlist. This helps us maintain high standards on the WooMarketplace, and helps The team at PIE improve. Glad to hear it went well with The team at PIE. Tell us more. Did The team at PIE get back to you? Do you have any additional feeback for us or The team at PIE? 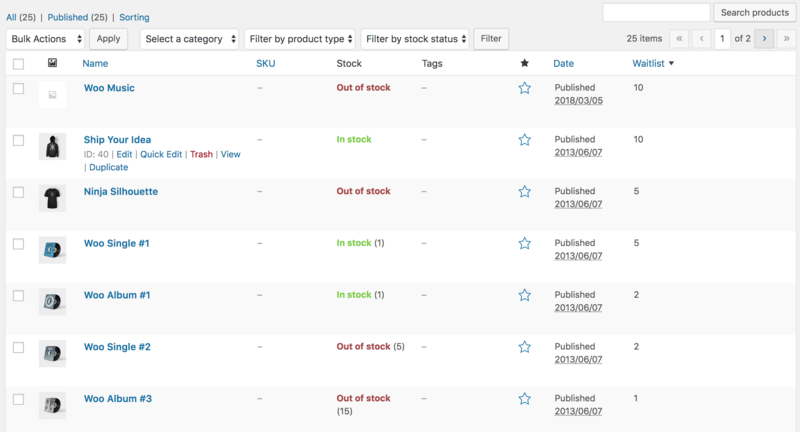 The WooCommerce Waitlist extension lets you track demand for out-of-stock items, making sure your customers feel informed, and therefore more likely to buy. Using a simple plugin, you can build up a waiting list of people wanting the unavailable item, then notify these customers automatically when products come back in stock. It’s really easy to install and will instantly start turning missed opportunities into future sales. Customers register for an email alert to let them know when a product is back in stock, increasing the likelihood they’ll wait and shop with you instead of going to a competitor. It makes people feel valued by your business, and allows you to replenish stock intelligently based on demand. 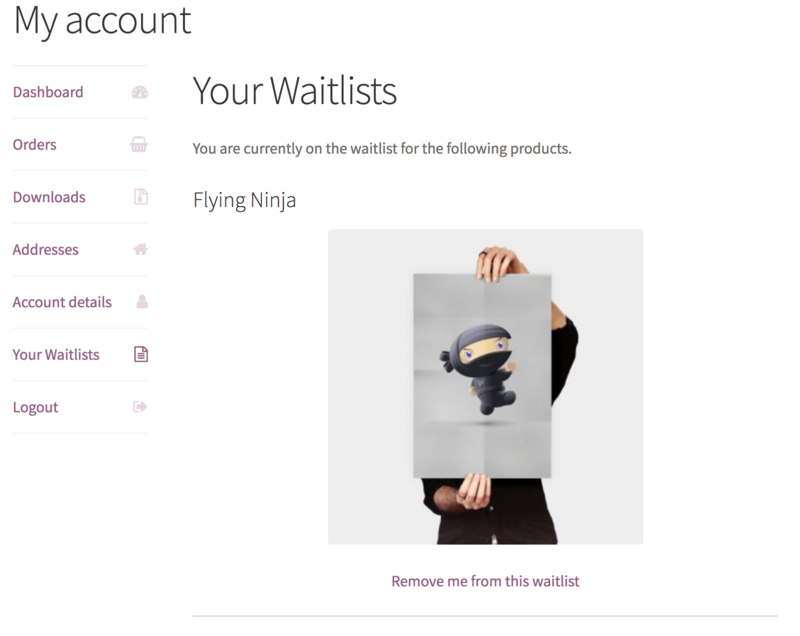 It takes seconds for customers to join a waiting list via a button on the product listing of your WooCommerce store. 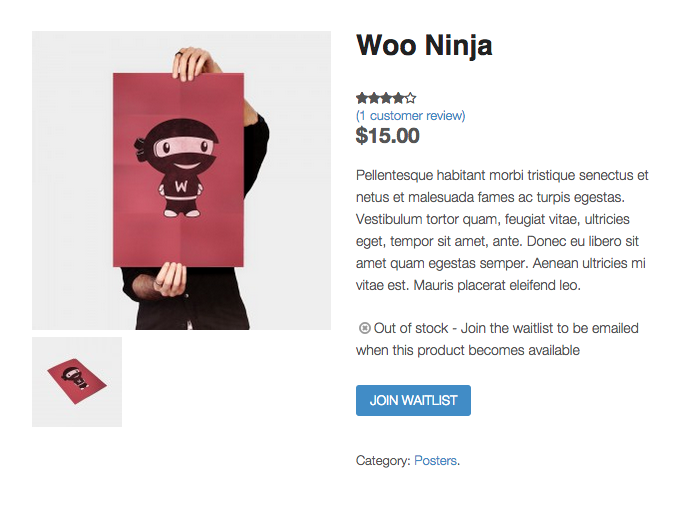 WooCommerce Waitlist fully supports simple products, product variations and the children of grouped products. With WooCommerce Waitlist, shop managers can sort products by number of customers on their waiting list. This allows them to quickly prioritize which products to re-stock. Shop managers can also view, manage and contact those on the waiting list for each product directly from the Edit Product screen through a custom product tab. Here, it is easy to add/remove users from the waiting list, see archived lists, export a CSV of users on a waiting list/archive and adjust the waiting list options for this product.